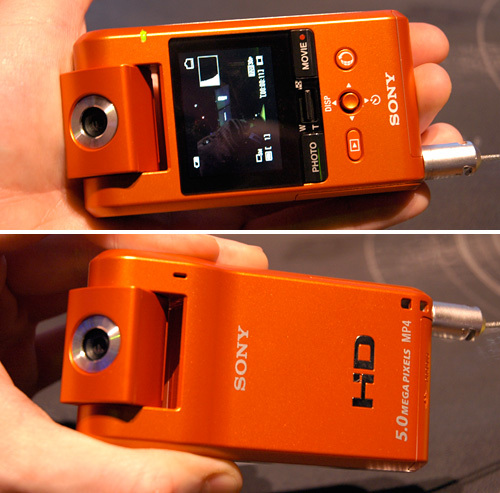 [CES 2009] Hands-On With The Sony Webbie HD Cameras | OhGizmo! Besides jumping on the netbook bandwagon, at their press conference on Wednesday Sony announced that they’d be entering the cheap and easy-to-use hi-def web video camcorder market with their new ‘Webbie’ cameras. Both models capture high-def MPEG4 video or 5 megapixel photos and come with “PMB portable software” making it easy to upload your shots or clips to online sharing services like YouTube. The MHS-PM1 Webbie pictured above (available in April for about $170) has a vertically oriented body and a rotating swivel lens making it easy to take self shots, while the MHS-CM1 pictured below (about $200 available now) has a more traditional camcorder body with a 5x optical zoom and a 2.5-inch swivel LCD screen. And both are available in your choice of orange, eggplant or silver color schemes. 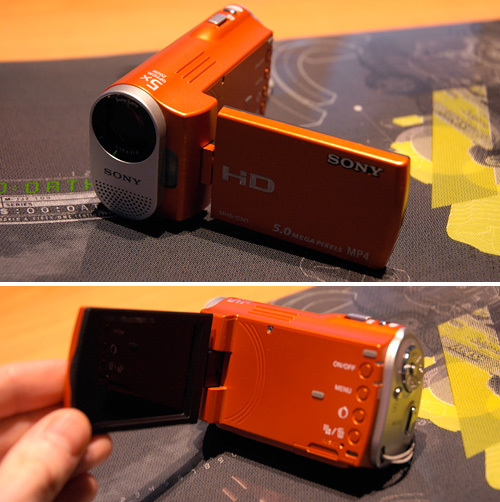 look cool in orange color, it has a more traditional camcorder body with a 5x optical zoom and a 2.5-inch swivel LCD screen. And both are available in orange, eggplant or silver color schemes.